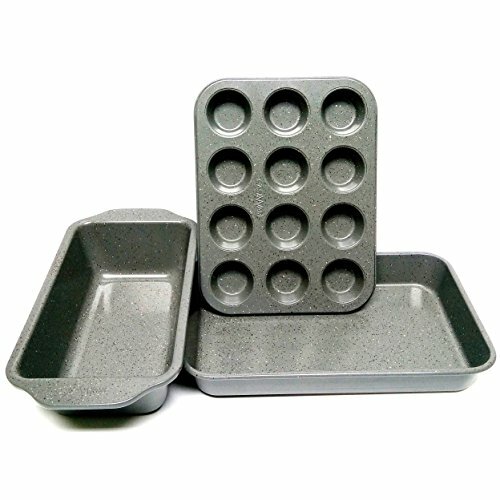 The pans feature our exclusive granite colored ceramic coated easy to clean baking surface. The coating has rich dark brown and tan flecks that make Casaware bakeware high fashion and high function. The exterior surface is coated with a high temperature non-stick brown colored finish. USE and CARE Instructions: Before First Use- Remove all packaging materials and labels. Wash in warm soapy water. Rinse and dry thoroughly with a soft cloth. UTENSILS - Plastic, rubber, silicone or wooden utensils are recommended. Avoid using any sharp objects or metal utensils because they can scratch any non-stick surface. Always remove food from the pan before slicing or cutting. CLEANING - Cool completely before washing. Hand wash with a soft cloth or sponge and nonabrasive cleansers or liquid dishwashing soap in warm water. Rinse and then dry with a soft towel. 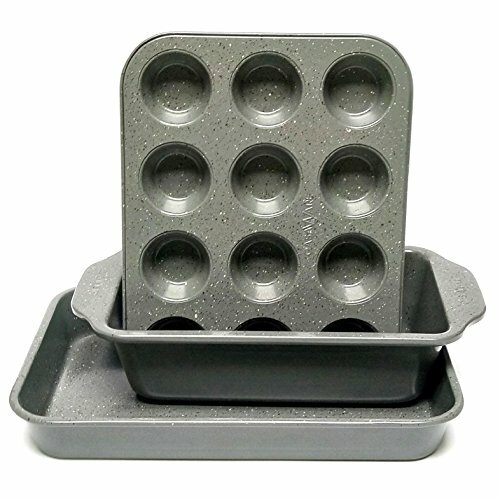 The pans should fit in most toaster ovens, all standard ovens and are perfect for traditional baking but also for baking fish, casseroles and all your other favorite dishes. The silver granite ceramic coating, over 0.6 mm heavier weight carbon steel body, provides long lasting Durability and Scratch Resistance. Heat Tolerant to 536F. No peeling or blistering in high temperatures. The Pans feature Casawares ceramic non-stick technology. Hand Washing recommended. Do not immerse in water. Do not microwave. Refer to product descriptions for Use & Care Instructions.